Lot:6009 Sparta, Georgia. $5 1902 Plain Back. Fr. 598. The First NB. Charter #7067. PMG Very Good 08. Sparta, Georgia. $5 1902 Plain Back. Fr. 598. The First NB. Charter #7067. 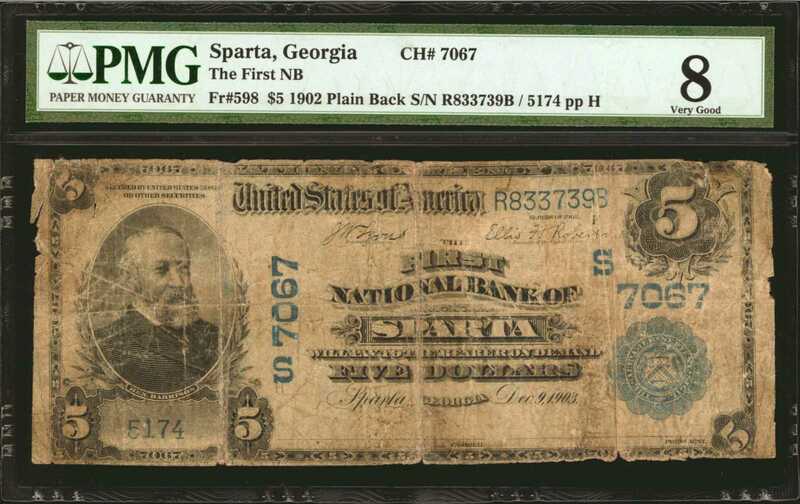 PMG Very Good 08.A rare Hancock County bank with an incredible name, SPARTA! Just four notes are known, three of which are in the same Very Good grade. The finest known, a PMG 35 sold for $8,050 in a auction in 2008. PMG comments "Paper Damage", as the note has some tears and heavy wear around the margins.